Looking to boost your social marketing performance? 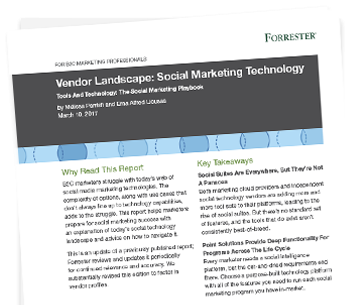 In this report, Forrester outlines key factors to help you navigate the social technology landscape and prepare for social marketing success. Social suite vendors are evolving. The report outlines the pros and cons of their offerings. Vendors are adding features to their platforms, but no standard set has emerged across competitors. Some vendors can help you bring the benefits of social marketing and social customer service together. Download the complimentary report to understand the advantages of choosing social suites over individual tools and get a representative list of leading social marketing suite vendors.